Question: You guys mention cog railways, lifts, cable cars and funiculars. How do I tell these things apart? Answer: The alpine countries of Western Europe offer some of the most sophisticated public transport systems found anywhere in the world. Their systems include trains, buses, boats, cog railways, lifts, trams, gondolas, cable cars, and funiculars. While most people probably understand trains and buses, not everyone can identify cogs, trams and funiculars. Here’s a quick mountain transport primer. We usually refer to a chairlift when we call something a lift, though the term is often used as a catch-all phrase for mechanized transport up and down a mountain slope. 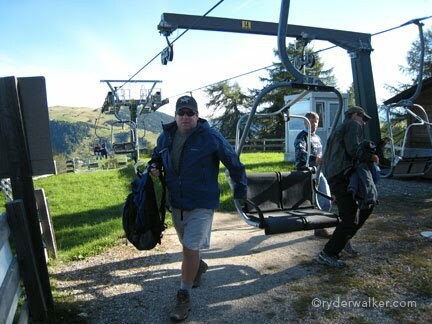 Skiers use chairlifts in winter, but hikers may also use them during the summer. By definition, a chairlift is a mechanized, cable-suspended, chair assembly. 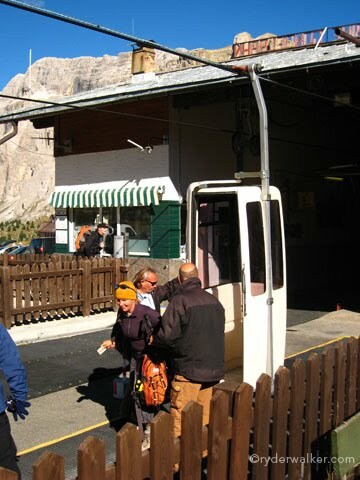 Chairlifts are fixed to a single cable, and the cable moves. Trams actually have two definitions. In the urban world, trams are known as streetcars. In the mountain world, the word tram refers to an aerial tramway. Aerial tramways are defined by the way they move. The cabin is suspended from a fixed cable and then pulled along by another cable called a haul rope. 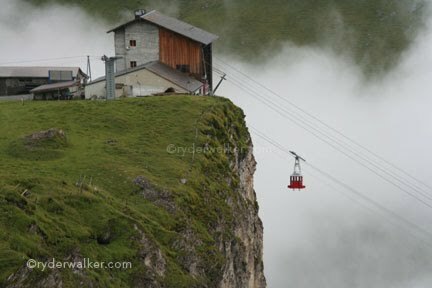 The above photo offers a nice view of the aerial tramway between Engstligenalp and Adelboden, Switzerland. This is a classic stop on many of our hiking tours through the Berner Oberland region of central Switzerland. Note: Many people use the term cable car interchangeably when describing gondolas and aerial trams. When in doubt, look at the cables. If the cabin is fixed to a single cable, and the cable moves, then it’s a gondola. If the cabin rolls along one cable, and is pulled by another, then it’s a tram. 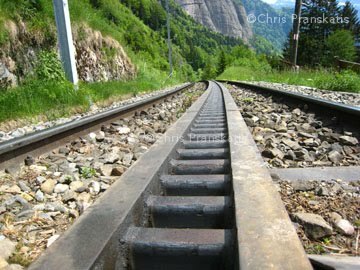 A cog railway, also known as a rack railway, is a railway with a toothed rail in between the running rails. The trains are fitted with one or more cog wheels, also called pinions, that mesh with this toothed rail. This configuration allows trains to operate on steep mountain slopes. A perfect example of a cog railway is the Pilatus Bahn in Luzern, Switzerland. 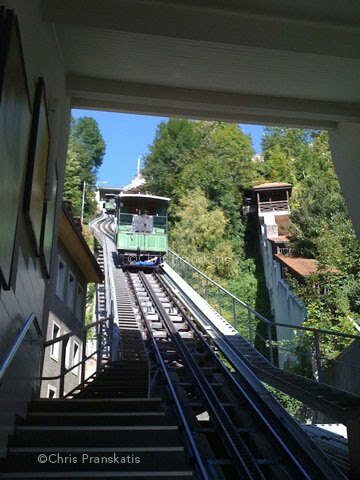 The Pilatus Bahn is the steepest rack railway in the world and climbs grades of 48%. A funicular, also called an incline railway, consists of two tram-like vehicles that ride along rails on a steep slope. The vehicles are connected by a single cable. Moving like the weights on a cuckoo clock, one vehicle descends while the other climbs. A driving motor also assists in the process but the counterbalancing of the vehicles makes the job a lot easier.